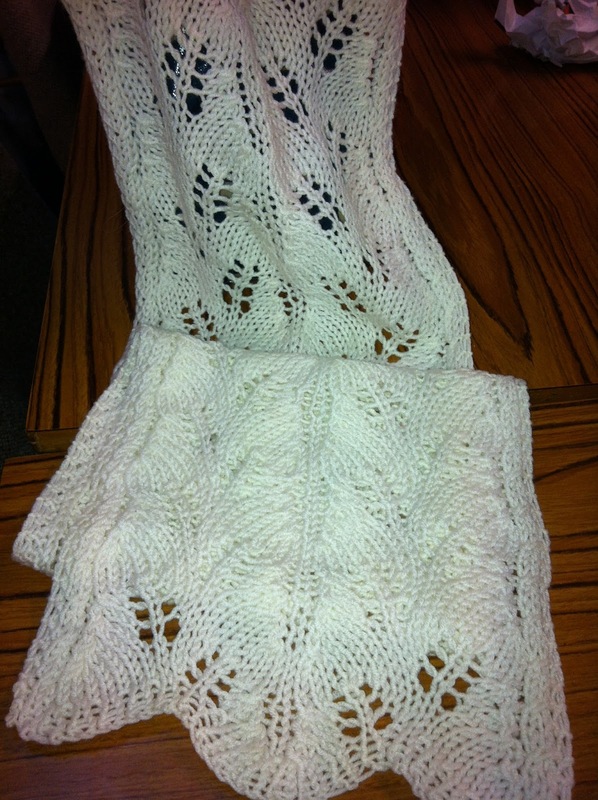 I finished the white silk and cashmere mix one, and gifted it to a friend as part of her 60th birthday present. She was thrilled with it. I was also thrilled with how it turned out. It's so soft and silky! Didn't have the patience for blocking, so I just pressed it. I know blocking would have been better, but a cool iron, lots of water spray with a drop of lavender oil added, and a tea towel to protect, and here it is. I was so thrilled that I decided I would knit another with some lovely pure alpaca that I've had in stash for years. And that was a younger friend's part-gift for her birthday. The indoor photo doesn't quite do justice to this lovely rich red, but going outdoors was out of the question. Now to viruses. Oh my, I have been sick! A bad virus, this one, wish I could name it. I had my first meal in 6 days today, and spent a good bit of the day out of bed. Yes, that bad. There's an upside to everything though. I lost some weight that I wanted to lose, and I got reacquainted with my sitting room! Part of the virus is a "swimming pool" head, dull headache and all noise seems loud. Oh, and the constant sound of a fan whirring, not too bad but I'll be happier when it goes. So, the sound of TV and chat is too much for me, and I've decamped to this room, which often goes unused. 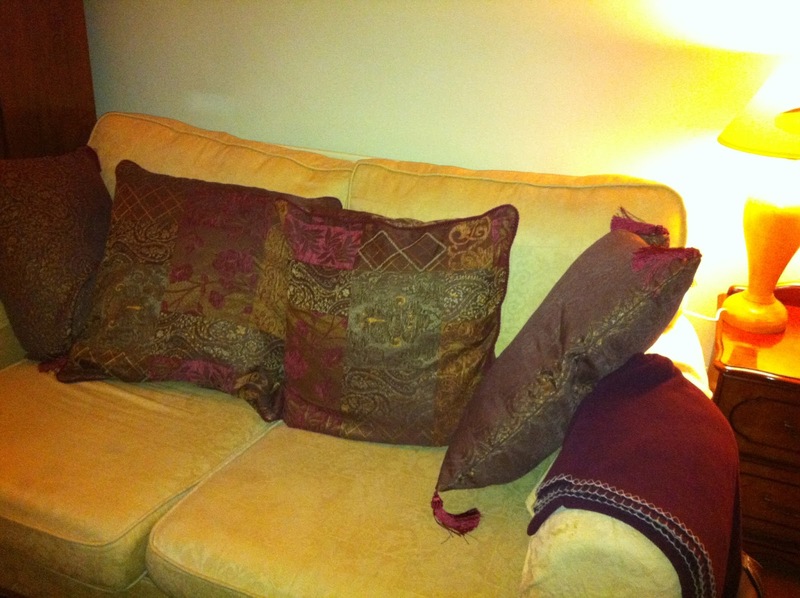 I bought new cushions before Christmas and they make for a very cosy space. With the fire lit, and ignoring the Christmas decorations that still remain (blurred photo is good, doesn't show too much! ), it's perfect for recuperation. 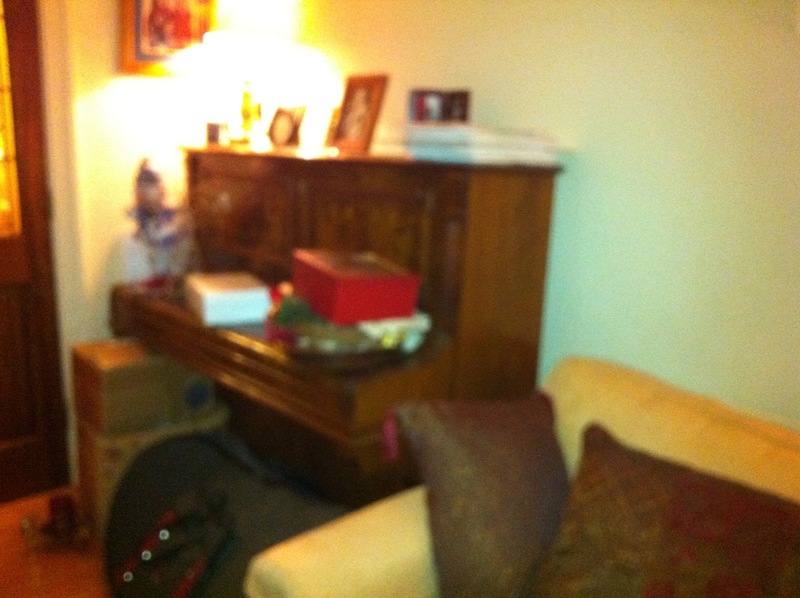 That's grey bag daughter's tuba under the piano, not a bag of decorations! That flu sounds like something wicked. Did you get the flu shot? I never get the shot but apparently it doesn't make much difference. Dr Oz had 4 doctors on his show and they were split as to whether they thought the shot prevented getting the flu. Glad the worst is behind you. Your scarves look like the ones my Mother used to make. She even crocheted bed spreads for everyone. I never was much good at crocheting but I knit. Yours look lovely. Sorry to hear about the flu, it sounds miserable :(. If you've got the energy to fix it (or have someone else to do so) try making an infusion out of the juice of half a lemon, 1 tbl of honey, a clove of garlic (sliced helps) and "as much cayenne as you can stand". Great immune booster, but also helps cut through that underwater feeling. I'm sorry that you have been sick. Your scarves are lovely. I hope you are feeling better soon. Love the scarves Mimi! I do sympathise about the virus, having spent today wiped out in bed... Hope it goes through quickly as I have things to do! I'm really sorry that you've been feeling so poorly. Hope you are soon back to normal. 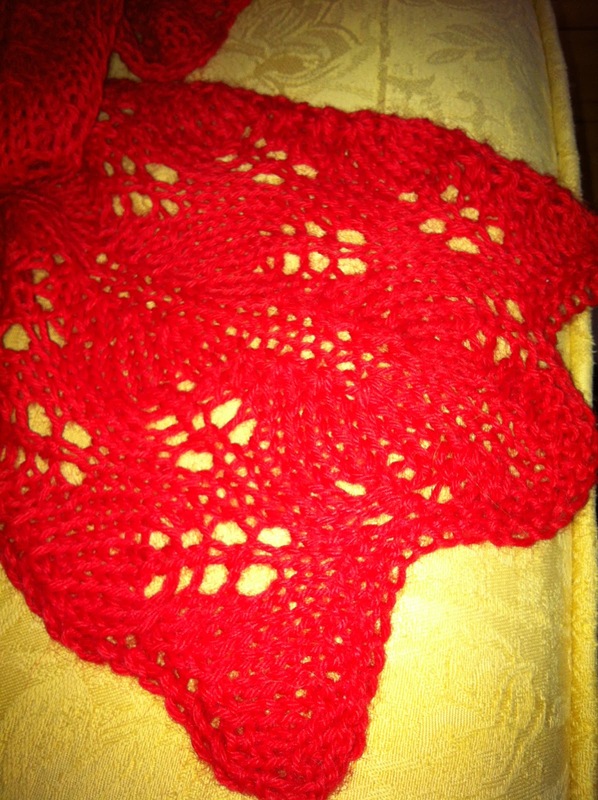 That lacy knitting is so beautiful........ just like gossamer. You are so clever. So sorry that the bug got you. It's hardly a rest if you're sick. Those scarves are gorgeous - anyone would be pleased with such a gift. Aren't we lucky to be able to work with such luxury yarns? That scarf is awesome .... so sad you weren't feeling well! Hoping you are better now!! So sorry you've been ill, hope you are on the mend now. You have my sympathy, I had a dose before Christmas, don't think I've ever been so ill. VERY glad it's behind me. Every blessing for a speedy recovery! The scarves are beautiful! The red is so vibrant. I've been ill for a week, too. Yesterday I got a little scared with a bout of shortness of breath, but went to bed and awakened today feeling quite a bit better. I'd asked my son to get a carry out order of spaghetti from my favorite Italian restaurant and he did, but much to my regret, someone else ate it last night after I'd gone to bed. I'm so sick, I can't really knit, either, which would make the time spent sick worthwhile. I fear what I've really done is lost a week. I'm not going to overdo it today, but truly feel I've turned a corner with this virus. I sure hope so. I hope you're better, too. Gorgeous scarves, Mimi, you're very talented. They are absolutely superb. I love the white one, it is very elegant. Sorry to hear you've been so ill. This weather is awful for viruses breeding everywhere. I get frightened of leaving the house some days with all the bugs about. I imagine doctor's surgeries have been inundated this winter with prescriptions for antibiotics. I'm so sorry you were sick. It must be that horrible flu that's going around that everyone is talking about. I'm glad you're okay! But your knitting is beautiful! I'm sure your friend was bowled over with her 60th birthday gift. Gorgeous!! 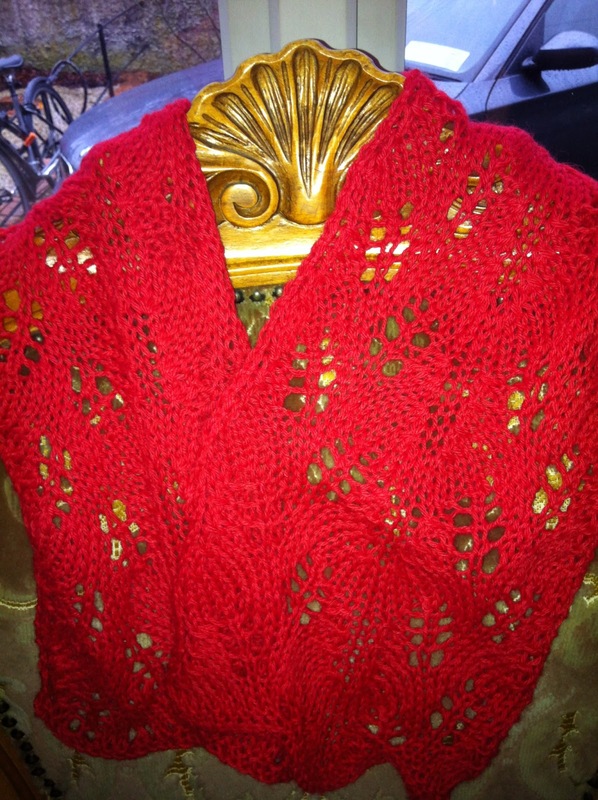 Lovely to discover your blog and I love the beautiful scarves you have knitted. Sorry to hear that you had the flu - my family had it after Christmas and sounds similar to what you had. That sounds like a terrible virus. I hope you're well on the mend by now. You sure do some beautiful work, Mimi. Gorgeous pieces. So sorry to hear about you being sick. I can't believe I'm just now getting over here to say that. I'm a terrible bloggy friend. The scarves are beautiful! Of course your friend was thrilled with it, who wouldn't be?! Was it difficult? I would love to try it. I deleted a post by mistake!